Not only have I been blogging every day this week, but today is a two-fer! 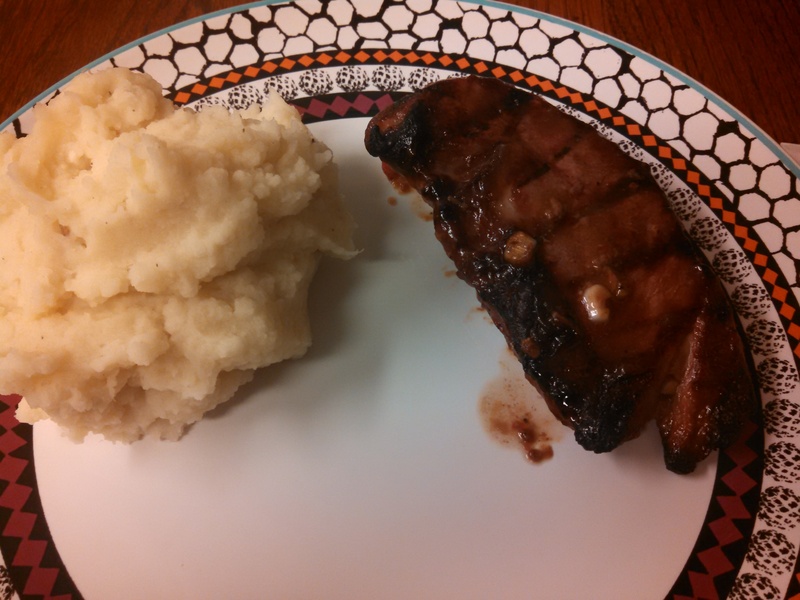 You can get your grilling on tonight with this Weight Watchers grilled steak and Hummus Mashed Potatoes from Gimme Some Oven. I had recently stocked up on some steaks on sale (most of my stories start like that, I’ve realized), because I’m a good wife and I know my husband loves steak…so what do I do? Create a WW recipe out of it. 😉 However, this marinade was just delightful! 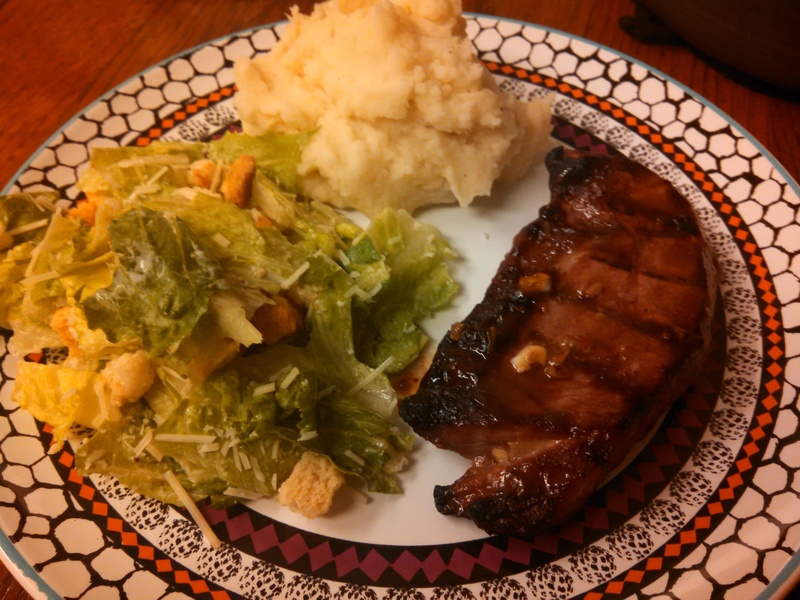 The steak was so tasty and flavourful and great to grill on a spring or summer day (or fall or winter…). The mashed potatoes were good too, but I added in more hummus than the recipe called for, and neither of us could taste it at all. They were good, just not good as advertised, if that makes sense. I used different potatoes (I can’t remember what kind though), so maybe the hummus just got lost in the potato flavour. In any case, it was still a successful dinner all around, and hopefully will be for you as well! -In a small bowl, combine chili sauce (or ketchup), sugar, garlic, Worcestershire sauce, mustard and ginger, and brush the sauce all over steak. 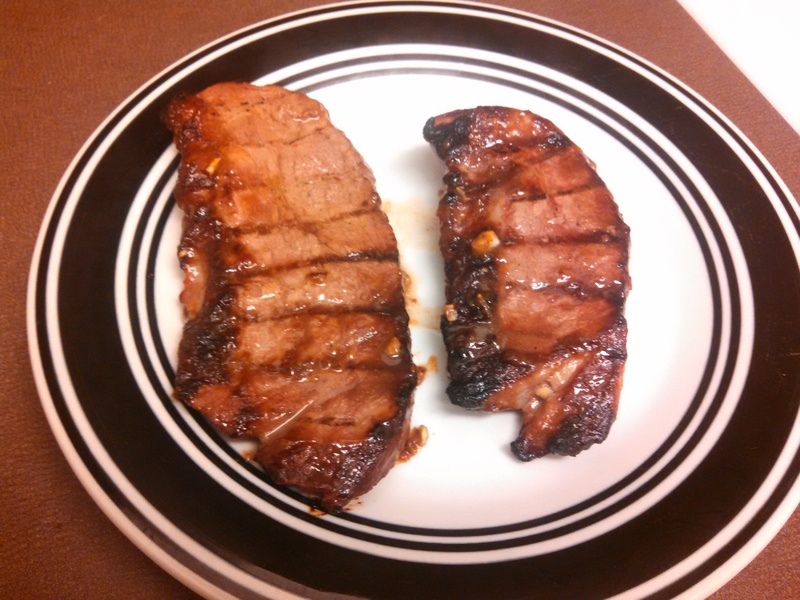 Grill, flipping once, brushing steak with any leftover sauce while steak cooks, about 6 to 7 minutes per side, or until desired degree of doneness. -Remove steak to a cutting board, cover loosely with aluminum foil and let stand for 10 minutes before slicing against the grain. -Peel the potatoes if you would like, and cut them into large chunks, roughly the same size. Immediately add to a large stockpot and fill with water until the potatoes are covered, then bring to a boil over high heat. Once boiling, reduce heat to medium and simmer for 20-30 minutes, or until a fork-tender. Remove from heat and drain the water. -Return the pot to the burner and use a potato masher to mash the potatoes until smooth. Then turn off heat, and add in butter, hummus, salt and pepper, and stir until combined. Season with additional salt and pepper if needed. Then top with garnishes if desired.